The action movie hero not only escalated their silly "Celebrity Apprentice" feud – he staked out higher moral ground in his video excoriating Trump's response to the explosion of hate in Charlottesville, VA.
Arnold Schwarzenegger took his feud with Donald Trump to a new level. Arnold Schwarzenegger famously flopped as host of "Celebrity Apprentice" – but that didn't stop him from symbolically firing President Trump. Sure, his video eviscerating Trump's equating of assorted white supremacists, Confederate flag wavers and neo-Nazis with their protesters escalated the duo's bizarre celebrity feud. But far more significantly, the storied action-movie hero and former Republican governor of California used his unique position to stake out higher ground. "You have a moral responsibility to send an unequivocal message that you won't stand for hate and racism," he said, addressing Trump. Schwarzenegger, of course, is far from the first major figure to slam Trump for blaming last weekend’s hate-fueled tragedy in Charlottesville, VA, on “both sides.” Everyone from politicians of both major parties to corporate leaders to TV comedians took aim at Trump's apparent tolerance of intolerance. But Schwarzenegger's viral video, released Thursday night, stands among the most effective rebuttals yet as the nation reels from the murder of anti-hate protester Heather Heyer. Ronald Reagan fan Schwarzenegger proved himself a great – and versatile –communicator in the three-minute, 42-second spot: He employed humor (mockingly lecturing a Trump bobble-head doll). He spoke in common-sense, patriotic terms ("The country that defeated Hitler's armies is no place for Nazi flags.”). He even tweaked one of his catchphrases ("Let's terminate hate."). The video, though, packs its strongest punch when Schwarzenegger invokes his experience as a son of post-World War II Austria, growing up "surrounded by broken men" who had fought for the Nazis. "These ghosts that you idolize spent the rest of their lives living in shame," he said, addressing neo-Nazis. "And right now, they're resting in hell." 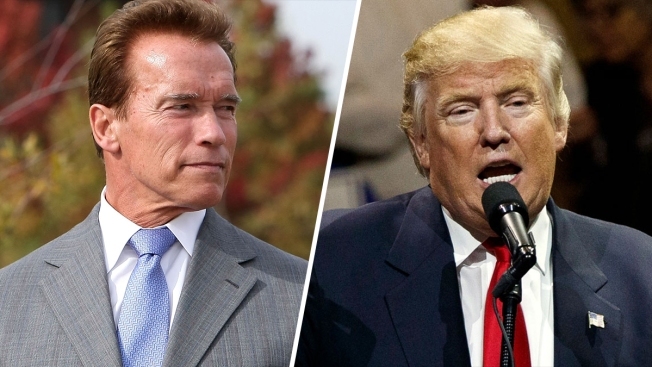 The video came six months after Trump's attacks on Schwarzenegger's weak "Celebrity Apprentice" ratings emerged as a sideshow to a political circus whose rings keep spiraling. The Twitter-happy President didn't immediately respond to the video, in which Schwarzenegger uses a favorite Trump insult – "losers" – to describe haters. Arnold Schwarzenegger can't fire President Trump, whose successful stint on “The Apprentice” helped launch him to the most powerful elected office on Earth. But Schwarzenegger showed that insipid TV feud or otherwise, he's ready fire back when there's an actual moral imperative to speak out.